Glad to see you popped back into today.This is our first challenge with Whimsy for the new year. Can you guess what the challenge is seeing how we have just started 2014, you guess it, the challenge is "Something New". This leave so much to your imagination, something new could be interpreted so many ways.... New paper, stamp, using new tools to make your card. I decided to use a couple things that are new to me to make this card... A new stamp released from Whimsy Stamps from designer Lia Stampz. This stamp is called birthday Princess and it's an adorable stamp to work with, I added a lot of stickles to give it that princess sparkle. I also used a new edge punch that I have never used before this card and I tried making a bow using a new technique. I would love for you to try to make a card using a new technique or new product and put it on the Whimsy challenge blog ( click here) for a chance to win some great digital images. I tried taking a closer picture so I didn't get a glare from the stickles, it worked but the angles a little different. What a sweet combination of purples. The bow and bling swirls are beautiful. Mid-January 2014 already, thank you for dropping by and sharing your inspirational art with us today. What an absolutely adorable card, Charlene. I am just delighted to have you share your amazing art with us, and I thank you for stopping by to play along. I hope you will be back by soon. My favorite color. Great job on it. Thanks for playing at Love to Scrap!!! 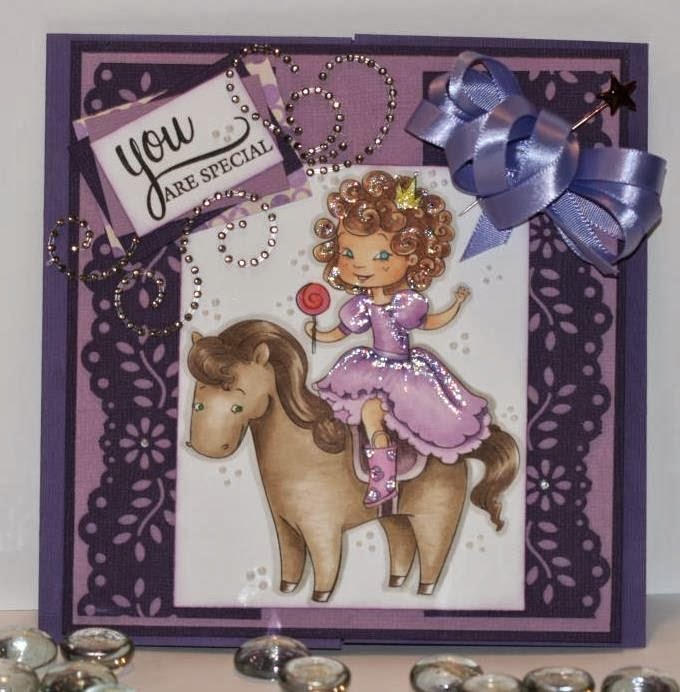 Great work on this image.. super cute card.. thanks for playing along with us at Love To Scrap Challenge Blog!! Thanks for playing our challenge at Love to Scrap, such a pretty card, and the detail so awesome. Way to go! Oh I love the colors....Hugs! Way to go friend for entering our challenge at One Crazy Stamper, always wonderful seeing your cards here. Love the details love the colors and the image is pretty sweet. Great job!